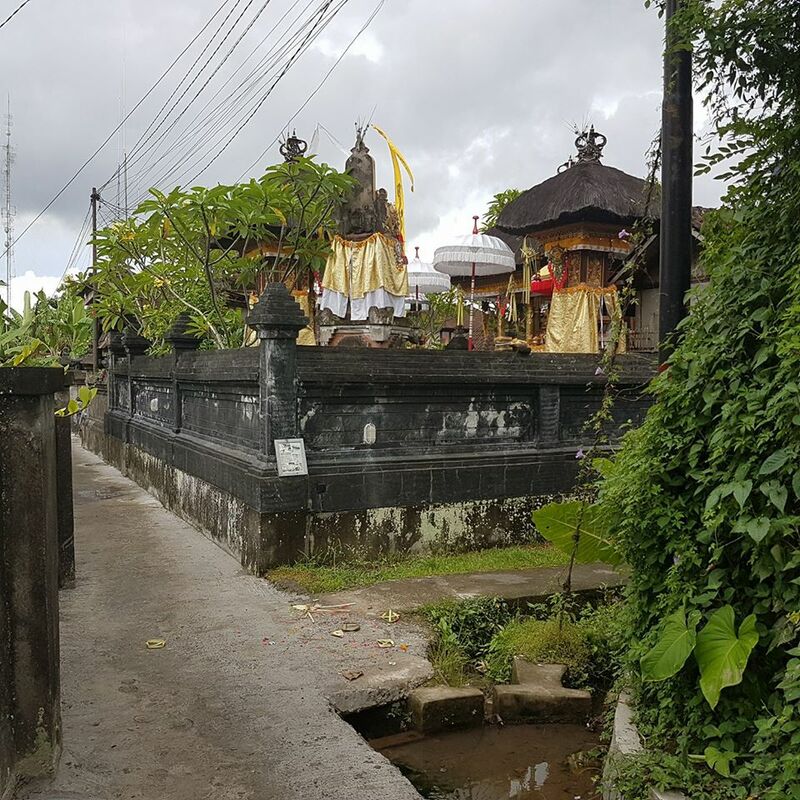 Ubud is said to be the kind of place that will either embrace you or “spit you out”. It draws you in with it’s quiet charm and the warm smile of its inhabitants, or it revolts your senses with its dirty roads, potholes, unfinished buildings and the swarm of tourists looking for a bargain. 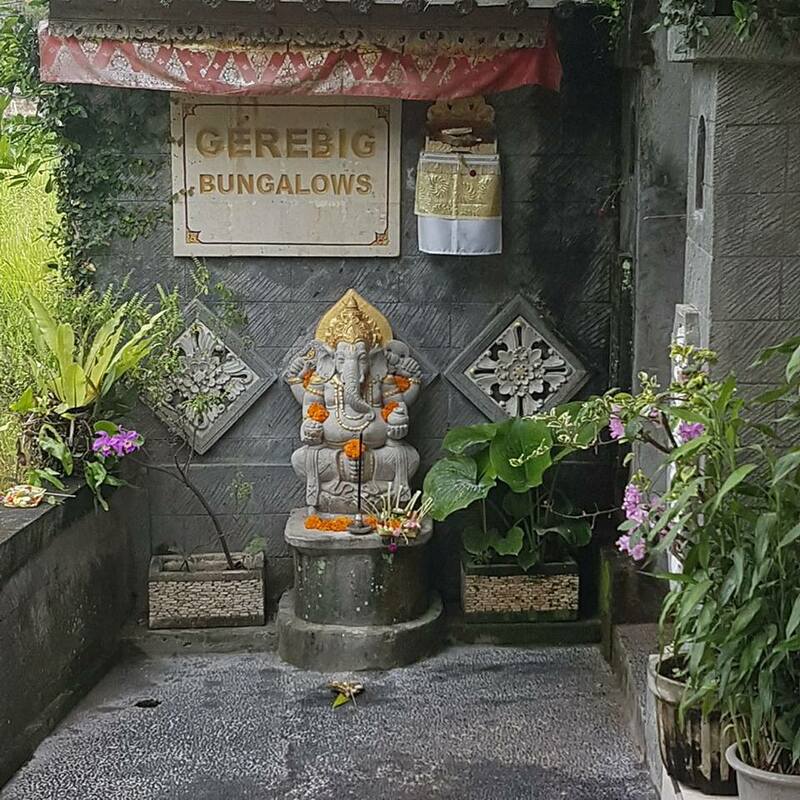 My first and until now only visit to Bali was 22 years ago, and the only place that I carried fond memories of was Ubud. An almost forgotten infatuation now rekindled. You can have your Kuta and your Semaniak, for me Bali is Ubud and Ubud has embraced me in return. By that I don’t mean the Ubud Palace or the Monkey Forrest, nor the endless shops that all seem to be selling the same clothes and artifacts. Ubud is the narrow lane-ways that connect the myriad of bungalows, unassuming houses and random temples. The tiny studios with the resident artists sitting cross-legged on the floor patiently painting, carving or weaving, oblivious to the outside world, the heat and humidity. 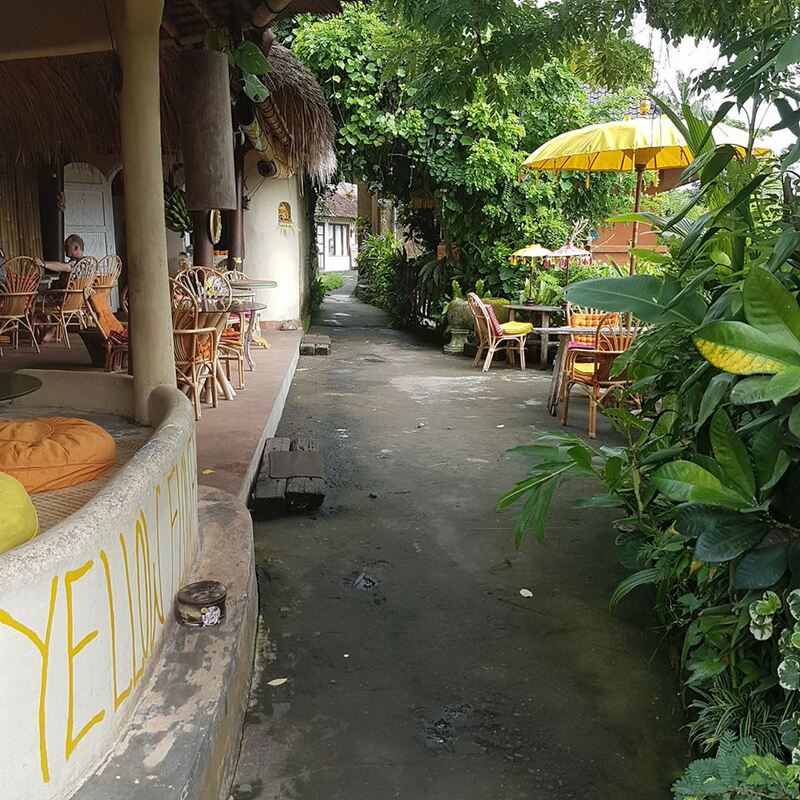 Ubud is all the little warungs – restaurants – tucked away in the most unlikely corners with more or less identical menus of home cooked delicacies. Ubud is also full of surprises, from “my” local Mexican restaurant with their quite unique take on Tacos and a house band playing Pink Floyd as if they had studied for years under the tutelage of David Gilmour. It is the Buddha Bar run by young Terrance from Perth with a natural flair for hospitality and making everyone feel special, whilst making sure he has the protection of the local “mafia” man; a portly youngster wearing only black, hair slicked back and a perennial smile on his face, with just the slightest hint of menace, shaking your hand for half a second longer than needed, all in perfect contrast to the colourful beads on his necklace and wristbands. Terrance is just one of so many stories of the people you meet in what is quite a cosmopolitan melting pot. From artists just wanting to escape the often oppressive and unforgiving arts scene of Sydney, writers who wants to live here cheaply just to concentrate on their writing, retirees who come here to relax and then end up returning again and again, until one day they discover that they are no longer visiting here; Melbourne, Amsterdam or London have gone from being where they live to the places they visit occasionally. I even ran into an elderly lady from Oslo who came here on holidays 17 years ago and just decided to stay. But Ubud is also a haven for young, energetic entrepreneurs from all over the world, over-crowding the many co-working spaces, dreaming up new ideas for bitcoins, creating the next “Uber” or just taking advantage of cheap accommodation, the warm climate and the sheer creative, yet so relaxed feel of the place. 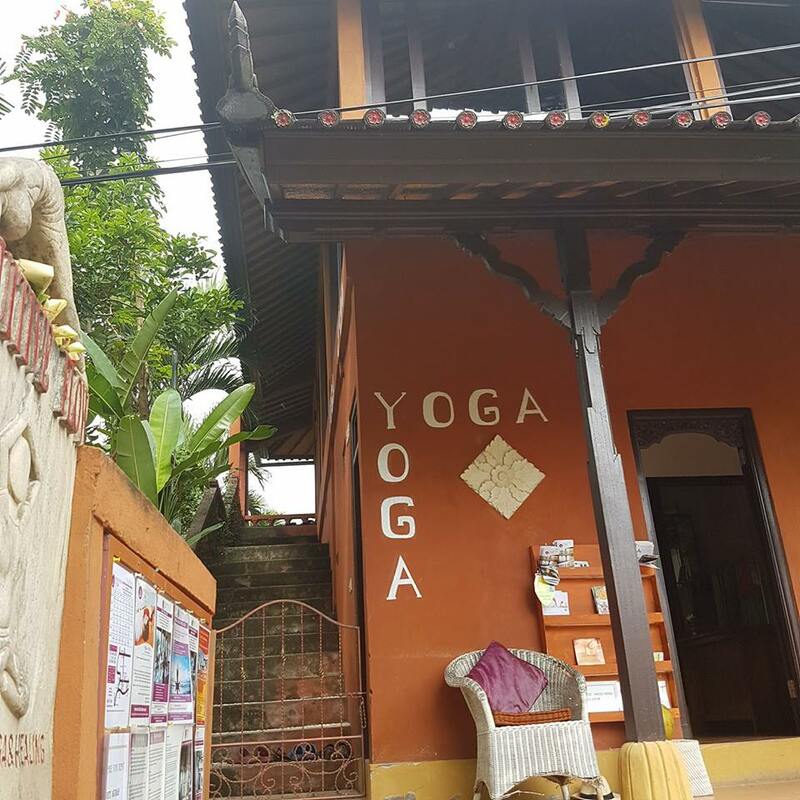 So relaxed that it surely has more yoga studios per capita than anywhere else. There are also semi-retired investment bankers who has realised that Bali is a lot closer to Singapore than Australia is, a lot cheaper, too, so actually a great hub for deal-making anywhere in the world. And in addition to the warungs some of the worlds best chefs are coming here to recreate their culinary master-pieces with a local flavour. And amongst all of this opportunity, diversity and ambition are the people of Ubud. With their quiet ways, always smiling, genuinely helpful, honestly labouring, slowly, with plenty of rest, knowing full well that the humidity and heat is not conducive to being in a hurry. And it is contagious. You come to Ubud and you just automatically slow down. Breakfast arrives when it does, not when you ordered it, but that’s OK. Despite my efforts at scheduling my activities I soon realised that every day in Ubud has its own rhythm. The locals organise their life around the many religious ceremonies and preparing for them. Ceremonial dress is worn almost as regularly as the traditional sarong, adding colour and a sense of celebration to their daily life. One of the many little things I got to appreciate was the daily offerings to the various Hindu Gods, tiny baskets of banana leaves filled with a bit of fruit or left-over vegetables and decorated with flowers, placed on the ground or on specially made tiny bamboo stick “cages”, accompanied by incense sticks. 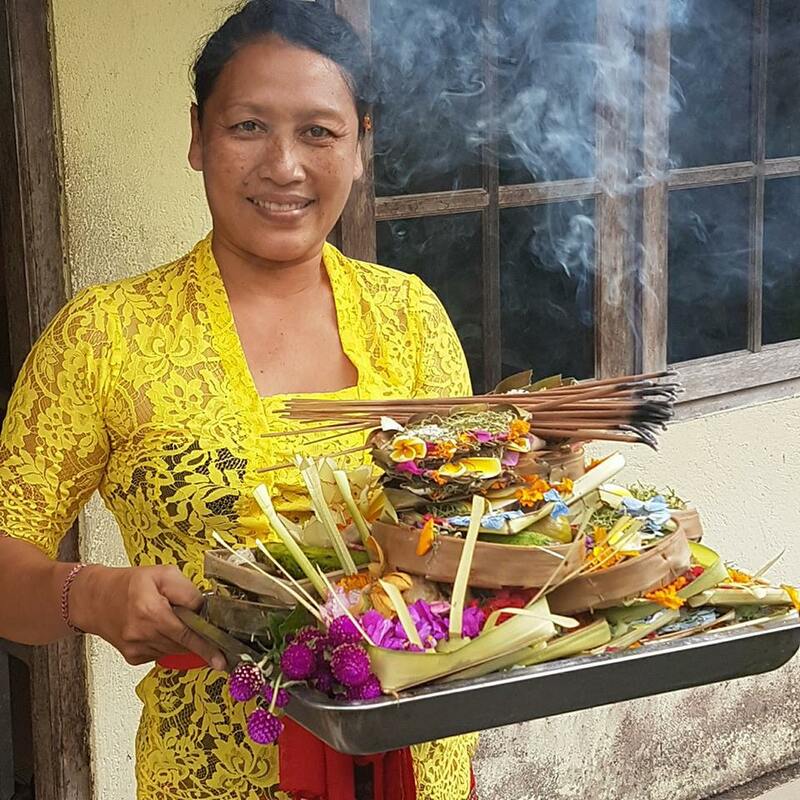 The smell of incense is the aroma of Bali as much as the gentle swoosh of the Sapu broom is its defining sound. That is if you choose to ignore (as I did) the traffic, the hootin’ and tootin’ of the scoobis (scooters) and little “people mover” style cars. The scooter outnumbers cars by a big margin and the narrow roads are full of them. If you are in a car they’ll overtake you on the left or on the right, they’ll block you at the intersection through sheer force of numbers. Whatever road rules exist here nobody seems to take them too seriously. Drive without a helmet with a sleeping baby over the shoulder and the dog between the legs, shopping bags hanging off the handlebars, one hand on the accelerator, the other on the mobile phone held to the ear, no worries. So no rules, then. But also no road-rage. No one finger salutes, no ugly stares if someone cuts you off, the Balinese way of going about your own business with a smile applies to the road, too. Which is why it is easy to not get annoyed by any of it. Same with the potholes, the debris on the road, the pavement blocked by parked cars or a bunch of men playing cards in their lunch hour. It is all part of the tapestry that makes Ubud a place of relaxed serenity. It is all part of the embrace. Thank you, I will be back.